Danielle Utter is a ball of fire….fire for a good cause. She is the Education & Programs Manager for the Clark County Historical Museum in Vancouver. I was blessed to meet her at the Clark County Genealogical Society conference the end of last May. I asked her to tell me more about the collections of the Museum. “How long do you have?” she prompted quipped back. 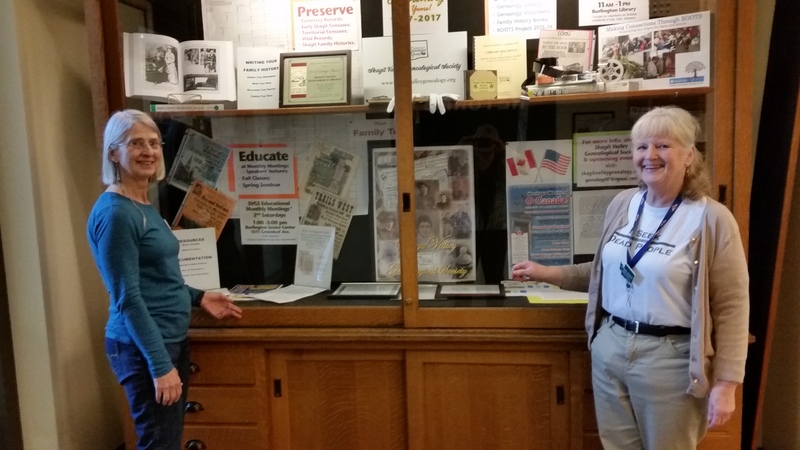 “We have 46,000 photos of Clark County history posted online; we have issues of the Vancouver Independent back to 1910; we have ‘rooms and rooms’ of boxes for artifacts; we have the local NAACP collection online; we have hundreds of oral history interviews all online and so much more! 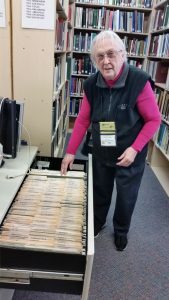 Ginny Majewski (president of the Washington State Genealogical Society) and I visited the museum together that day and were so very impressed by their library…… shelves and shelves of archival boxes of documents all labeled for ease of access and more shelves and shelves of books regarding local history. Danielle explained that they do work on mail or email research requests for a per-hour fee, but it’s free to anyone to come use the library in person. “Most folks come looking for information on property, homes and people” of this area, she said. The museum partners with other local smaller museums; they have a First Thursday speaker series; they offer periodic historical Walking Tours (like of the old City Cemetery) and they have changing exhibits. The next exhibit, “Music, Movement & Sound,” features the Cotington piano, the very first piano in the Northwest, Danielle happily explained. Danielle Utter welcomes questions, especially questions about photos to donate. You can contact her via the museum website, www.cchmuseum.org. Thanks, Danielle, for a lovely (and too short!) visit. 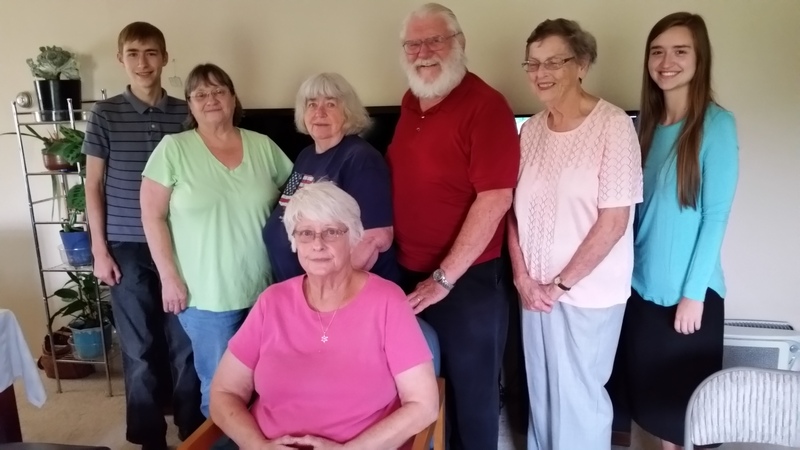 This is the hard-working board of the Whitman County Genealogical Society. From R to L: Luke Sprague (webmanager), Sue Rogers Kreikemeier (president), Janet Margolis Damm (librarian), Monica Bartlett Peters (research chair), Judy Standar McMurray (newsletter editor), Corinne Lyle (recording secretary), and Margery Rounds Muir (vice-president). Missing was Judy Rice (treasurer). Did you notice the plaque they show displaying the WSGS awards made to their members??? They proudly display this in their library and at meetings. Want to know more about this most-southeasternly genealogical society in Washington? Click to www.whitmancgs.org. You’ll be amazed at what a little group has accomplished. 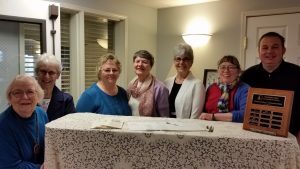 The Northeast Washington Genealogical Society is not only alive and well, but it is thriving! 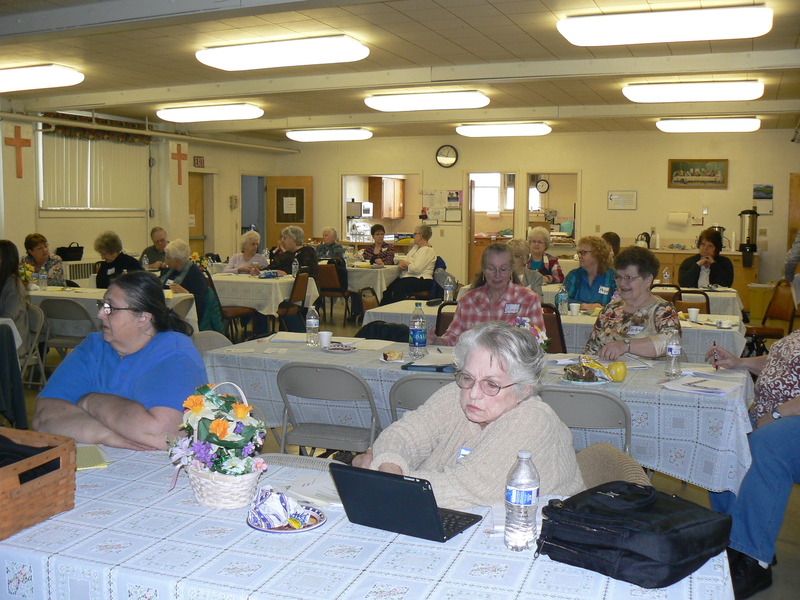 I attended their meeting in Colville on Wed, Mar 14th, and 35 were present….up a good ten from usual, President Karen Struve explained. “We send out meeting reminders to nearly 50 too,” Karen said. Kathy Ochs teaches a repeating beginners class and coming from that are a flock of prospective new members. Good for them, way up in Stevens County, the northeast corner of Washington. 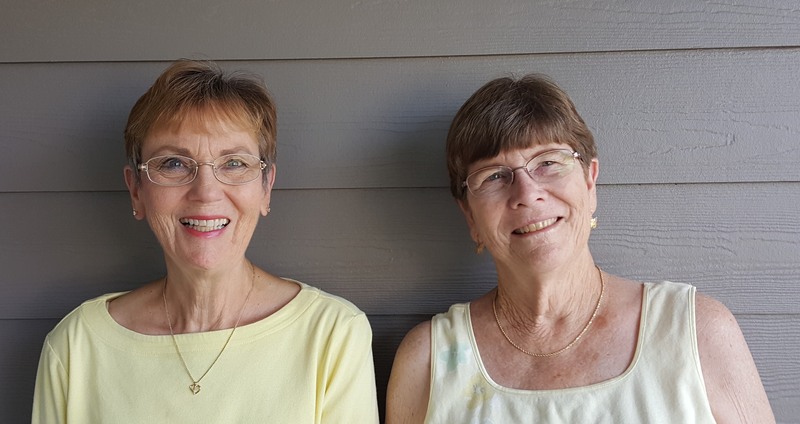 This group has published nearly two dozen books on their area and one, Little Journeys, is in its third printing and had an order from Germany. On a sadder note, their periodical, Pioneer Branches, has been discontinued due to lack of support (nobody will step up to do it!). I asked about continuing and new plans and projects and they have plenty. Their major focus of time and energy is the care and keeping of the Evergreen Pioneer Cemetery where they have reset stone, replaced stones and done repeated massive cleanups. (A WSGS grant went to this group to fund the removal of a huge, leaning tree threatening the cemetery.) They work with the Stevens County Historical Society on research requests and projects. 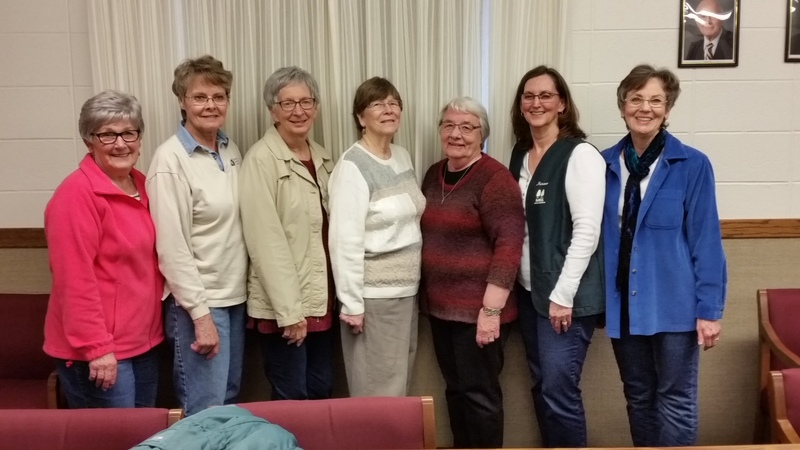 The above group photo is of the NeWGS board: (L to R) Kathy Ochs (beginners’ class); Lora Rose (Evergreen Cemetery); Sue Witham (treasurer); Susan Dechant (past president); Mary Ann Schrader (member-at-large); Norma Yost (vice president); and Karen Struve. Not present were Sharon Wilson (recording secretary) and Helen Swords (corresponding secretary). I 100% enjoyed my lunch and time with them for they are upbeat, energetic and positive and that makes genealogy FUN, wouldn’t you agree? 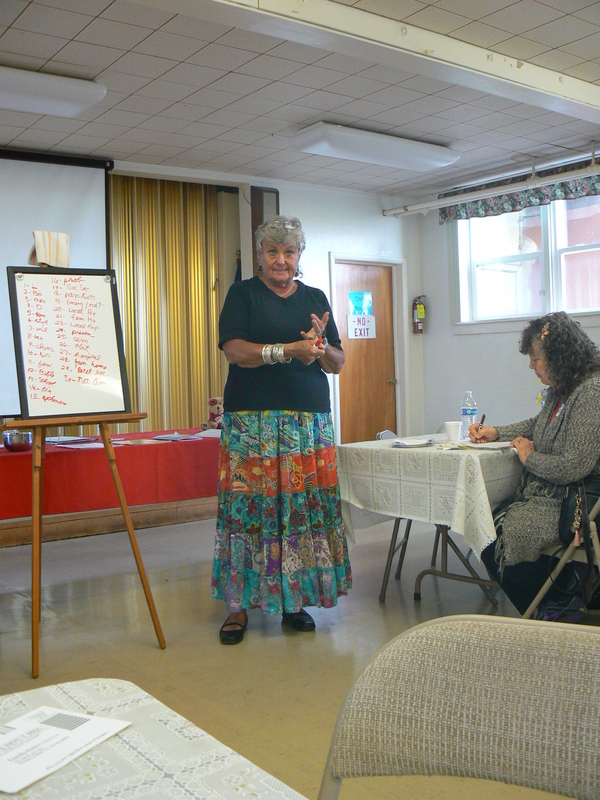 I met with the dedicated and eager bunch of the Okanogan Genealogy Society members in early September. President Noma Wyllson arranged a lasagna dinner for the board (and me) at her home. The ginormous project the group has embarked upon is to created an online database of all the Okanogan County cemeteries (and Okanogan County is the biggest county in Washington), with the names and GPS locations of the burials. They are gleaning this information from a dozen sources. Ultimately, they would like to include a complete biography on each person and an interactive map on their website where you can click on an arrow for that cemetery. Talk about ambition! As we chatted (and as a representative of the Washington State Genealogical Society), I also asked about the problems the society was having. Noma quickly quipped: “We were adrift and going nowhere and so I became president and took charge!” We agreed that a big project, like their cemetery project, would do wonders for the morale and growth of the society. Other “problems” were the usual ones: what’s the best day/time for the meetings and how to attract and keep members. Sharon Liebert, of Wenatchee, is the WSGS Rep for Region 8, which includes this society and will be working to help them in any way she can. Anyway, John had made an appointment with Faith McClenny, the head volunteer researcher in the Pend Oreille County Historical Society in Newport. She had consulted the index to The Newport Miner, the weekly newspaper in publication since 1897, and marked several references for him regarding the history of lumber mills in the area and some about is mill of interest. We also were directed to the Index of the Lumber Industry of Washington’s Pend Oreille Valley, by David H. Chance, published in 1991. What a marvelous 325-page reference to the principle industry in the area which greatly fostered settlement. Faith has been working with Pend Oreille County records for over twenty years, she proudly told me. She has an Arcadia Publishing book on the county to her credit too. She showed me around the historical collections and I took notes, wishing I had all day to stay and search. NeWGS was founded in 1981 with the goal of preserving the histories of Stevens, Ferry and Pend Oreille counties (the far northeast corner of Washington). Their membership averages about 60, with 25-30 coming to meetings, and their genealogical collection is housed in the Colville Public Library. Their biggest problem is the same as so many societies face: lack of participation of members and a core group doing all the work. Susan and Karen have bounced the presidency back and forth several times. Their long-standing publication, Pioneer Branches, has been discontinued because nobody would step up to be editor/coordinator. Their day-of-meeting computer classes have also been cancelled, again due to lack of folks stepping up to help. No bearers of gloom and doom, Karen and Susan were upbeat and enthusiastic. “We just got three new members!” Karen told me. Their biggest project is to maintain the Evergreen Cemetery (which they own). Member Lora Rose has crafted several tombstones for known burials that had no marker. 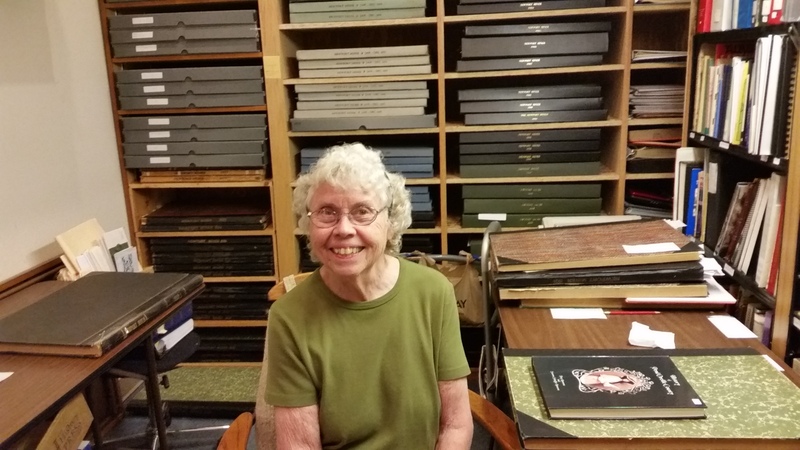 Member Sue Richart regularly drives the 160 miles to Pullman to digitize papers from the WSU special collections that pertain to their area. And they will again this year have a promo booth at the Colville Fair in August. They do work with the Stevens County Historical Society and will do research by mail. Check out their website, www.newgs.org. 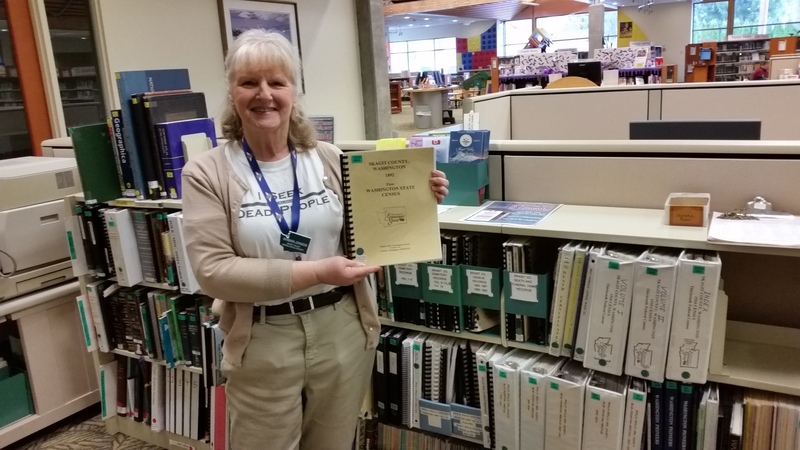 I’m proud to do a spotlight on the Northeast Washington Genealogical Society today! 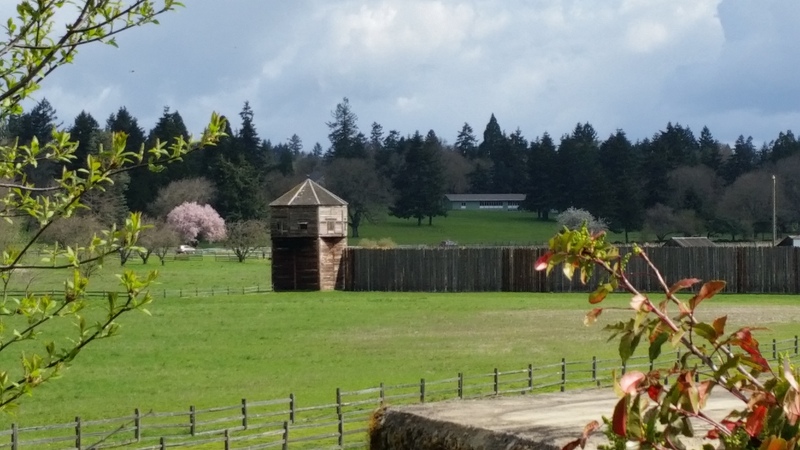 Vancouver, Washington, is a history “hot site” for Washington. With Fort Vancouver’s history going back 200 years and the First People’s history going back much further, Vancouver was an exciting place to visit. Past president and current librarian for CCGS is my long-time friend, Lethene Parks. 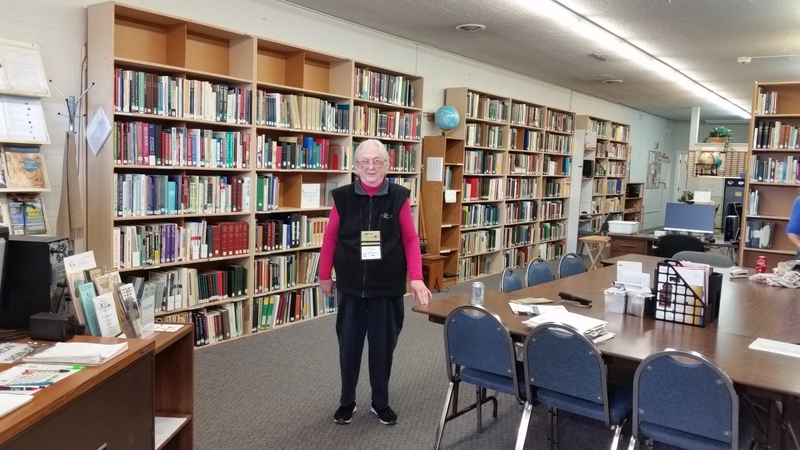 In between sessions of a history conference that we both attended, she showed me around their society’s library. And she just as proudly showed off their Pioneer File. The Twin Rivers Gen Society, located in Lewiston, Idaho, is just across the Snake and Clearwater Rivers conjunction from Clarkston, Washington. Guess who the towns were named for? I was honored to be their program speaker back in March and found them to be an eager, active group…… and very proud of their area’s history and very engaged in preserving same. Patricia VanBuren arranged the day and at risk of saying a tired old cliche, a good time was had by all. Especially me! The Lewiston Public Library is currently in an old hardware store, in the basement, where dirt sifted through the old wooden floors down onto the books. 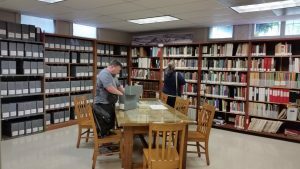 Members of the TRGS were (happily) given permission to remove the genealogy books and they are now (March 2017) stored in boxes in a member’s home. There is no levy support for a library so things for the Lewiston Public Library look bleak. Before the LPL, the TRGS collection was housed in the Heritage Room of the Nez Perce Historical Society temporarily (before being ousted from there too). Members of the TRGS are hopeful that their genealogy collection will be placed in the newly remodeled Family History Center in Lewiston. The biggest annual event of the TRGS is their July 4th Walking with Ancestors which they have done for several years. The group picks stories from the biggest/oldest cemetery, Normal Hill, and in costume tell those stories. The event is free to the public and last year they had an attendance of about 75 folks (not bad for a society of about 25 folks). 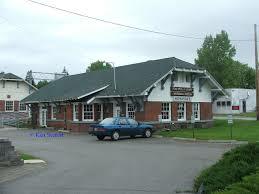 Lewiston was incorporated as a town in 1861; that is the year the Civil War began! After much conflict with the Nez Perce tribe and boundary shifts, Lewiston, Idaho, (along with partner across the river, Clarkston, Washington) are thriving places. The WSGS mantra was again proven true: You will never know unless you go. While attending the March 25th seminar in Lewiston, Myrna came up to me asking a question. She lives in Grangeville, Idaho (some 40 miles away in Idaho County). Myrna explained that the small group of genealogists in that town had saved boxes of old county marriage records from being tossed from the courthouse. These records date from the 1930s to 1969. Myrna wanted to know what should be/could be done with these records? My answer was that FamilySearch would most likely jump at the chance to come digitize these records. We talked to Lee and RaeVon, the directors of the local Family History Center, and (wowsers!) they knew of an LDS person in the area who was already on a mission there to find and digitize just such records! Don’t we consistently find that miracles do happen in family history?? On April 8, 2017, I had the honor of giving a “SKGS for 30 Years” talk to the Skagit Valley Gen Society group to mark their 30th anniversary. 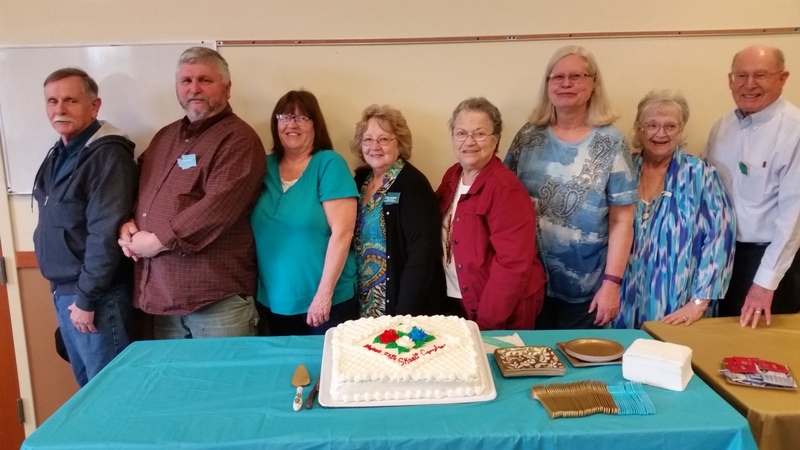 The board gathered in front of a lovely cake: (L to R) Len Torset, Don Royal, Dottie Chandler, Carol Nersten, Diane Partington, Candace Stone, Hazel Rasar and John Hays (president). Marge Wilson was missing. Several of the founding members from that day back in 1987 are still members! The Society’s scrapbooks (kept by Don Royal) were out for viewing and a certificate of appreciation was given by President John Hayes to Diane Partington for all her service and help. Our new WSGS Regional Rep for the Region 1-North area is Nancy Bonafede, a member of SKGS. This is a great little group! Saturday, May 27, 10:30 a.m.-12:30 p.m.